createRecoveryHDUpdater 15.2.28.command – Will now download Apple’s RecoveryHD Updater via Safari and will make a self contained dmg with interactive script to update your Recovery HD as well as a script to make a .pkg also! createRecoveryHDUpdater.command – Combines Apple’s RecoveryHD Updater and your App Store 10.x Installer to make a self contained RecoveryHD updater/creator disk image. Neat. Updated to work with Mavericks. AddItemToDock – Command line utility to add items to the dock. XProtectPluginChecker – Quickly survey the status of Java, Flash, and any other Plug-Ins Apple deems insecure and unworthy of your usage. Updated to work with Mavericks. myXProtectStatus – A drop down status menulet, showing date, version, and threats protected against in the Xprotect plist. Written in bash, wrapped by Platypus, it is informational only (so don’t ask me to add some menu item to do something, it just reports). Tuck it away somewhere, add to your loginitems. Updated to work with Mavericks. Safe Downloads Info – Dashboard Widget that reports the version, date/time, and auto updates status for OS X’s Safe Downloads list. UPDATE: Auto-Updates status can only be determined by root via command line (unlike System Preferences which allows a standard user to determine this via the GUI). So, this has been removed from the widget (since running widgets as root isn’t allowed nor is reading the launchd overrides list). Unless I find some other way… Updated to work with Mavericks. ToggleDock – Toggle the Dock appearance from “glass” to “no glass” when in horizontal mode. I like your widget so I tried myXProtectStatus but it gives an error. ‘Can’t make “Oct” into type integer’ I am running Mac OS X 10.7.2. Never mind. Today it works. Odd. Thanks, its great. Hi, I am trying to use your “removeitemfromdock” application to remove face time and the app store but when I install the .pkg you’ve provided nothing actually installs into the /sbin folder so when I try to run the command from terminal I just get “command not found”. This is on 10.7.4. I’ve been beating my head against the wall trying to remove the Facetime.app from the default dock and I’ve tired everything, editing default.plist, copying a com.apple.dock.plist to the User template folder, etc. none of them seem to work so this is my last resort. I have updated the Readme file in the installer and added some bug fixes also. You made my day with your createRecoveryHDUpdater.command ! So nicely authored, so well documented. Saved me from the lame tips of “Install OS X over your installation for Recovery HD recover”. No cheesy guys, i don’t want my nicely defragmented OS X partition get overwritten all over again. The article regarding “createRecoveryHDUpdater.command” was really very helpful, when I decided to grant my old MacMini from 2006 with Lion (yes, changed the CPU to a Dual Core, so a new installation of Lion is very complicated) a 120 GB Samsung SSD. 4. Clone the internal harddisk to SSD with SuperDuper (command line utilities should work, too, but ditto failed in my case). 5. Try, if you can boot from external SSD (reFit is very helpful). 6. If yes, reboot the internal disk again and create the recovery partition with “RecoveryHD Updater.command” created by the above mentioned tool. Tata! It worked perfectly. I built in the SSD instead of the old internal disk and all went fine. The performance yield is impressive. The SSD is perfect configured without new installation. Hi- stumbled across your utility via ivanexpert.com. Thanks for the script; helped get a Macbook Air ‘mid-2013’ away from always running ‘internet recovery mode’ when all the user needed to do was perform a Disk Utility/Repair Disk procedure. 1) since the script runs ‘under’ windows that it opens it would be nice if it wrote a log file that could be reviewed afterwards. Could especially be helpful for new OS X releases, ‘strange’ configurations, etc. + if the recovery partition exists and if so what OS X recovery version is on this partition? + What OS X version will be installed vs what version is currently installed. 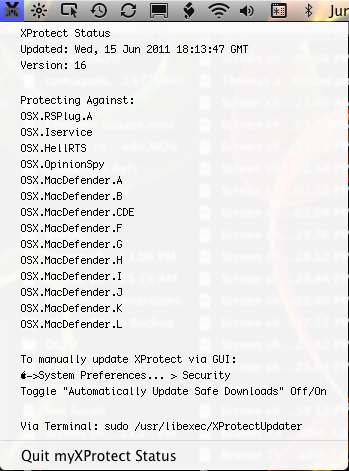 #get values from XProtect and local version, etc. Here’s to sharing and caring; THANKS to you!